^ Garcia-Eroles X, Mayoral V, Montero A, Serra J, Porta J (2007). 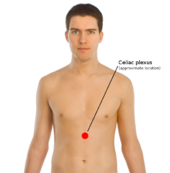 “Celiac plexus block: a new technique using the left lateral approach”. The Clinical journal of pain 23 (7): 635–7. doi:10.1097/AJP.0b013e31812e6aa8. PMID 17710015. Anatomy photo:40:10-0101 at the SUNY Downstate Medical Center - "Posterior Abdominal Wall: The Celiac Plexus"